How "the Most Intelligent Car Ever Built" lost its mojo, and how I fell out of love. I was 8 years old in 1972 when my father brought home a secondhand Saab to replace our broken-down International Harvester Travelall. It was a 1970 Saab 95 station wagon, a light-brown, bug-eyed, squat-front, square-back thing, and I was immediately in love. It had a fold-down rumble seat that fit exactly two kids, and my brother, sister and I would fight over who got to sit there. The rumble seat faced backward, and I loved looking out the rear window and watching the road recede. Now, barring some unexpected intervention, Saab itself seems poised to recede into history, sucked down by the larger recession and the brand's unfortunate association with General Motors, one of America's biggest losers. Initially a builder of military planes for the Swedish Air Force, Saab began producing cars after World War II, and it first exported cars to the U.S. in 1957. The early Saabs were slope-backed and aerodynamic, as though a VW Beetle had been smoothed and stretched by a great wind. The teardrop shape was vaguely reminiscent of the much larger Citroen DS, but unlike the low, sleek, elegant Citroen, the Saabs of the 1940s, '50s, and '60s (models 92, 93, 95 and 96) were homely and purposeful. Interiors were hard plastic and metal, windshields nearly flat, instruments few and simple, giving the dashboard a bare, functional look. This was a machine for safe and efficient transportation -- a "well-built Swede," as its ad slogan said in the 1970s. Growing up outside of Boston, our family was a Jewish, academic, bohemian clan living in a largely Irish and Italian working-class neighborhood, and it made perfect sense that our car should be this peculiar little vehicle among the hulking Chevys and Chryslers of our neighbors. We were different, and so was our car. Saab's oddities were legion. Up through 1967, Saab used two-stroke, three-cylinder engines that required owners to add a quart of oil to each tank of gas. Many Saabs through the mid-1970s had a freewheel feature, allowing the car to coast forward while still in gear, saving gas and reducing engine wear. Starting in 1969 with the Saab 99, Saab put the ignition key between the two front seats near the gearshift, not on the steering column where it would normally be found. A few years later, the Saab 99 became the first mainstream car to offer a turbocharged engine. Saabs, along with Volvos, were also prized for their safety, pioneering crash-resistant design and passenger protection years before Ralph Nader forced American car companies to take safety seriously. Saabs have always been front-wheel drive, giving them great traction and making them especially popular on the icy roads of New England; aside from Saab, front-wheel drive was a rarity in the U.S. until the late 1970s. These unique qualities and quirks helped to foster a culture and community of Saab owners. Through the 1980s, even as their popularity increased, Saabs were still sufficiently unusual to prompt exchanges of knowing nods between Saab drivers. Saab's dealers and mechanics were also an eccentric bunch, generally specializing only in these semi-exotic Swedish imports. My parents' service man for the little station wagon was an old Saab hand named Jay Morgan who occasionally accepted my mother's artwork in lieu of payment for repairs. 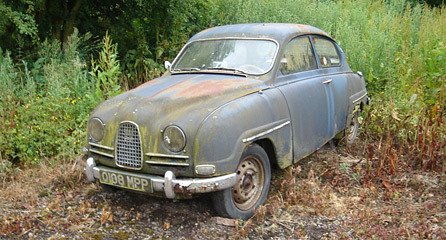 We kept that first Saab for 10 years, until most of its body panels had completely rusted through. We sold it for $100 to a high-school friend of mine, Doug, a fellow Saab lover who cut the roof off with an acetylene torch so that he could use it to haul wood. Doug had earned my teenage admiration when he told me that he drove his Saab 96 in ice races across frozen Vermont lakes. By the time we sold the family's first Saab, my siblings and I were all so embarrassed by it that we would duck down in our seats as we drove past kids we knew, ashamed to be seen in our beat-up little put-put station wagon. My father bent to the pressure for a more respectable car just as I reached driving age, when he bought a red secondhand Saab 99. While my real car-crush was on Saab's rare plastic-body two-seater Sonett sports car, the 99 sedan was infinitely sexier and racier than our little station wagon, and as soon as I had mastered its clutch, I loved driving it. Our family went through five Saabs in 22 years, and by the time my father had had enough, I had already bought my own Saab; I drove that dark blue Saab 900 until the fabric interior had crumbled to dust, and then bought a slightly newer 900 in which I'm still rattling around Brooklyn, N.Y., today. I realize that my loyalty to Saab owes more to the car's quirky, practical past than it does to its General Motors present. Much like Apple products today, Saab at its prime appealed to people who appreciated well-considered design and who saw themselves as different. Saab's slogan in the 1980s was "the Most Intelligent Car Ever Built," and to drive one was to realize that someone in Sweden was indeed thinking different. The Saab 99, released in 1969, was the last car designed by Sixten Sason, the Swedish industrial designer who had given every previous Saab its unique styling. It was phased out in 1984, giving way to the Saab 900. While similar in its overall shape, and still recognizably a Saab, the 900's design lacked the toothy toughness that had defined its predecessors. It was Saab's first luxury car, and it was longer, wider and heavier than the 99. When the 900 model superseded the 99, Saab was no longer competing with the hardy, utilitarian likes of Volkswagen and Volvo (before Volvo, too, went upscale), but instead facing off against luxury brands like Audi and BMW. While previous Saabs had been simple cars and were easy to understand and repair, the 900 was an early high-tech car, and the 900s I've owned have not aged gracefully. The Saab of the 1980s and 1990s was no longer the "well-built Swede." Saabs had become expensive to repair, and their quality, to put it kindly, was inconsistent. But we find ways to forgive those we love, and so to this day, I have continued driving Saabs. General Motors bought a 50 percent share in Saab in 1990 and steered the redesign of the "New Generation" 900 series in the early 1990s, leading to a Saab that was rounder, softer and more commonplace than previous models. The 900 was renamed the 9-3 in 1998, and was joined by the more expensive 9-5 sedan and wagon. The definitive signal of Saab's descent from iconoclastic brand to commodity vehicle was the Saab 9-7x, a wholly generic midsize SUV introduced in 2005. In a March 12 article, Bloomberg.com quoted Stephen Pope, a Cantor Fitzgerald strategist, dismissing the modern Saab as "a pale shadow of the beast it was right up to the end of the 1980s. Now it's just a re-skinned Opel or Vauxhall, that won't catch a Beemer or Mercedes buyer." It is likely that when GM began thinking of ways to dispose of the failing brand, it must have assumed those socialistic Scandinavians would rescue Saab with government money. Sweden would never let such a national icon fail, would it? But the Swedes have apparently called GM's bluff. "The Swedish state," said enterprise minister Maud Olofsson recently, "is not prepared to own car factories." The Swedes may loan Saab money -- if, and only if, Saab can find private investors. Asian carmakers are rumored to be among its potential saviors, but in the current climate, salvation may not come at all. Long before Saab's imminent demise seemed possible, I had decided that my next car will not be a Saab. Yes, the ignition key is still down between the seats, but it seems that the key location and the logo are all that is left to connect me to the thoughtfully designed, odd-shaped cars of my youth. Yes, I will be sad to see Saab's demise as a brand, and it's surely a tragedy for Swedish autoworkers, but GM had so thoroughly stripped Saab of its special qualities that I will not mourn the loss of the Saab in its current condition. If, as seems likely, Saab's rescue does not materialize and it is forced to shut down, we can hope that a new transportation company will emerge to make efficient, peculiar vehicles that will bring us safely home. Artist Ben Rubin lives in Brooklyn, N.Y. His permanent installation "Movable Type" (with Mark Hansen) opened in 2007 in the New York Times headquarters building. He is currently working on a sculpture commission for the lobby of New York's Public Theater.